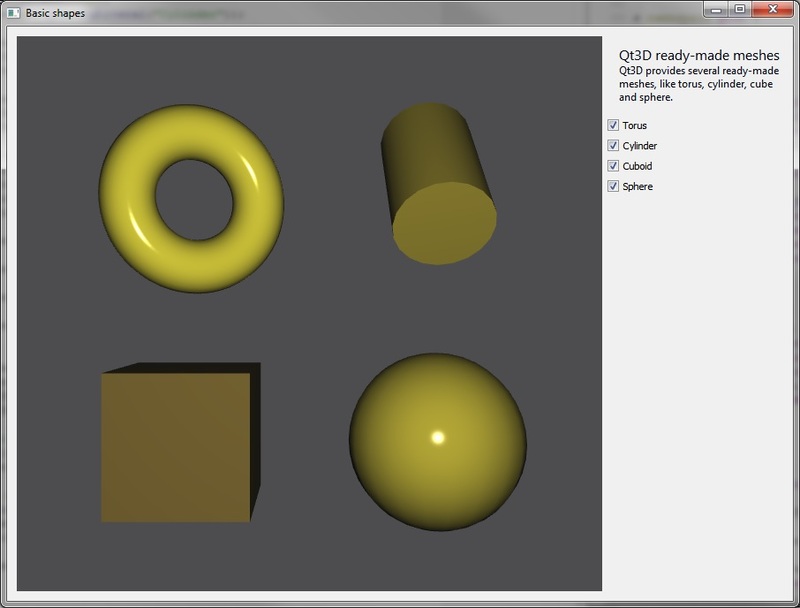 Basic Shapes shows four basic shapes that Qt 3D offers: a torus, a cylinder, a cube, and a sphere. The example also shows how to embed a Qt 3D scene into a widget and connect with other widgets. As an example, we go through how to set up a torus mesh. First, we instantiate the QTorusMesh, and then we set the mesh specific parameters, which for torus are radius, minor radius, and the number of rings and slices. The size and position of the torus can be adjusted with transform components. We create scale, translation, and rotation components and add them into the QTransform component. To change the diffuse color of the mesh, we create a QPhongMaterial and set its diffuse color. The final step is to add the torus into an entity tree, and we do that by creating a QEntity with a parent entity and adding the previously created mesh, material, and transform components into it. We can control the visibility of the entity by defining whether it has a parent or not. That is, whether it is part of an entity tree or not.